Truckers in sub-Saharan Africa are at higher risk of contracting HIV than the general population. HIV self-testing may be a way to increase testing rates in this high-risk population. The objective of this randomized controlled trial was to assess whether informing truckers who do not test for HIV regularly about the availability of HIV self-testing kits at roadside wellness centers in Kenya using text messages would increase HIV testing rates compared to the current program in which they are sent text messages about the availability of HIV testing in general. A sample of 2262 male truckers registered in the North Star Alliance electronic health record system who, based on these records, were not testing for HIV regularly were randomized to one of three study groups in which they were sent text messages about the availability of (1) oral HIV self-test kits at all 8 North Star Alliance Kenya clinics that was sent three times (intervention), (2) HIV testing in general (not self-testing) at all North Star Alliance clinics sent three times (enhanced standard of care [SOC]), or (3) HIV testing in general (not self-testing) at all North Star Alliance clinics sent one time (SOC). We looked at HIV testing over a 2-month study period following the first text. Truckers in the intervention group were significantly more likely to test for HIV compared to those in the enhanced SOC (OR = 2.7, p = 0.009). There was no difference in HIV testing between those in the enhanced SOC and the SOC groups. 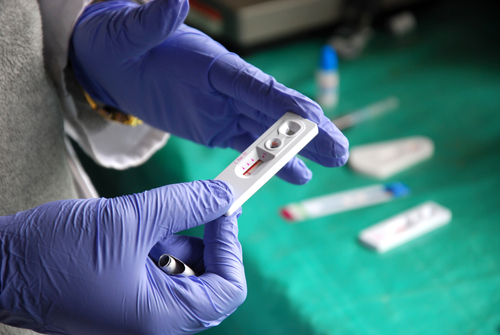 Of those in the intervention group who tested, 64.5% chose the self-test and 35.5% chose the standard provider-administered blood-based HIV test. Although the intervention more than doubled HIV testing rates, because HIV testing rates were so low in this population (by design as we selected irregular testers), even in the intervention group more than 96% of participants did not test. Announcing the availability of HIV self-testing via text message increased HIV testing rates among truckers who were not regularly accessing HIV testing. However, self-testing is only a partial solution to increasing testing rates in this hard to reach population. Nixon, S., Hanass-Hancock, J., Whiteside, A., and Barnett, T.
Burgess, R. A., and Campbell, C.